Slate features front camera, 8 GB internal storage, 1.2 GHz CPU, and supports external 3G dongles. Android 4.0.4 (Ice Cream Sandwich), Google Play. ARM Cortex A8 1.2 GHz with 512 MB of DDR3 RAM. 8 GB internal storage; 32 GB microSD supported. 9", 5-point capacitive touchscreen with pixel dimensions of 800x480. USB OTG with support for external 3G dongles, HDMI-Out (Full HD), 3.5 mm audio jack. 6000 mAh Li-ion battery supporting up to 4 hours of Wi-Fi browsing and 6 hours of video. 10.3" (l) x 6.5" (w) x 0.43" (11 mm) (d), 348 grams. Package Contents: Data cable, User manual, Screen guard, Reliance data card coupon, Charger, Headset, OTG cable, Warranty card, Pouch. Before you consider getting the Mi-book Mi9 for yourself, you need to pay attention to a few important details: The CPU is a dated A8 with just 512 MB of RAM, which could make it difficult to run ICS apps and games satisfactorily. Large screens are attractive, but the 9" screen in this case (which is considerably larger than with 7" tablets) still has the same pixel dimensions of 800x480. This means the pixels are larger in size and less densely packed — so images will not be very sharp. 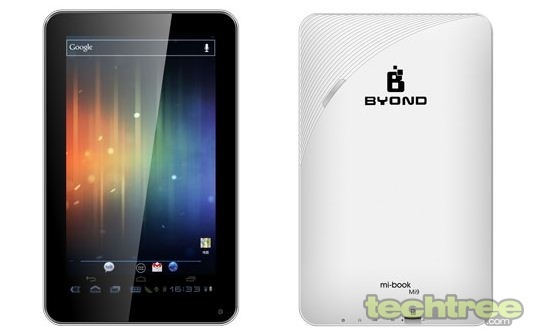 The Byond Mi-book Mi9 is available for Rs 7500, which is reasonable for a 9" ICS tablet — even considering the low pixel density.